The highly anticipated groundbreaking for The Store, nonprofit free-referral based grocery store, happened this morning. On hand for the ceremony were co-founders Brad Paisley and Kimberly Williams-Paisley along with Belmont University President Dr. Bob Fisher, The Store Board of Trustees Chair Megan Zarling and The Store Trustee member and architect David Minnigan. David Minnigan presents special print to the Paisleys and Dr. Fisher. “I’m so excited to be here and see this dream come to fruition. In Nashville there are 1 in 7 people and 1 in 5 children that have food insecurity. That means they don’t know where they are going to get their next meal. The Store will be another resource to help families and individuals going through a hard time but working toward self-sufficiency.” says Kimberly Williams-Paisley. 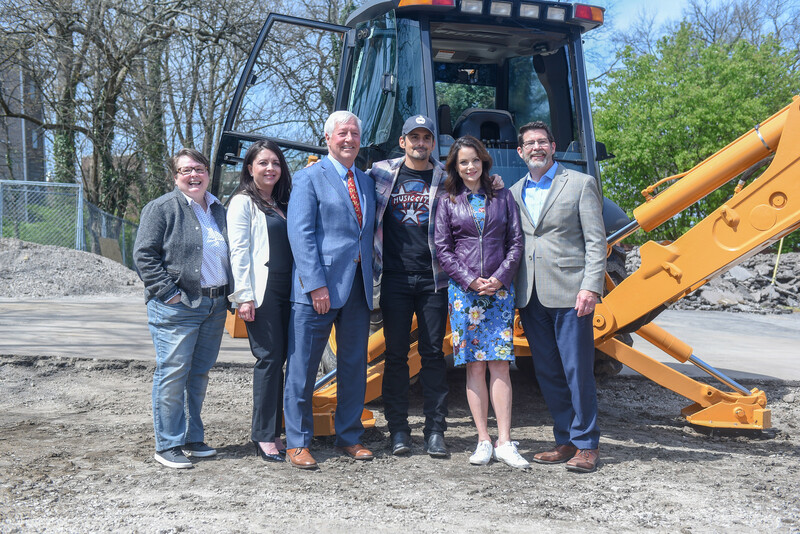 Brad Paisley uses a backhoe to officially break ground for The Store. The estimated cost of the building is $1.5 million for 4,000 square feet. To complete raising funds for The Store’s construction, the “Brick Campaign” has been launched. With a donation of $500 or more, donors will receive a personalized 4×8 brick that will create the sidewalk in front of The Store. There are a limited number of bricks. Donations are accepted via the website.